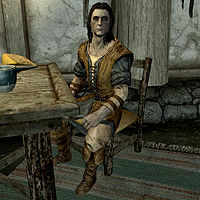 Mallus Maccius is an Imperial citizen who works at the Honningbrew Meadery in Whiterun. Once you complete Dampened Spirits, he will become the Thieves Guild fence for Whiterun, though he is actually located at the meadery rather than in the city itself. Mallus wears a set of farm clothes and a pair of boots. He is equipped with a steel dagger. Mallus started working at Honningbrew after borrowing money from Sabjorn, the owner: "I made the mistake of borrowing coin from Sabjorn. He's allowing me to pay it back, but he's working my fingers to the bone! He treats me like a slave... I have to do every nasty, dirty job in the meadery." Sabjorn himself will gloat when asked about it: "Mallus is the best deal I've ever made. Lent him a bit of gold some time ago I knew he'd never be able to pay back. Nothing like free labor to make operating costs cheaper." However, free labor doesn't mean efficient: "I bought some poison. I was going to have my lazy, good-for-nothing assistant Mallus handle it, but he seems to have vanished." Although Mallus claims Sabjorn treats him like a slave, it would seem he lives a comfortable existence. From midnight to 6am he sleeps in his bedroll on the third floor, right on top of the entry. After an hour of breakfast, he will be found in front of the bar waiting on potential customers until 8pm, although he does take an hour break for lunch at noon. He then enjoys a particularly long dinner until his bedtime at midnight. You will first be sent his way during the related quest by Maven Black-Briar: "Head to the Bannered Mare in Whiterun and look for Mallus Maccius. He'll fill you in on all the details." Sure enough, you'll find Mallus sitting in the inn drinking. When you approach him he'll cut to the chase: "I'm going to keep this short 'cause we've got a lot to do. Honningbrew's owner, Sabjorn, is about to hold a tasting for Whiterun's Captain of the Guard and we're going to poison the mead." If you ask him whether he's got the poison he'll gleefully say: "No, no. That's the beauty of the whole plan. We're going to get Sabjorn to give it to us. The meadery has quite a pest problem and the whole city knows about it. Pest poison and mead don't mix well, you know what I mean? You're going to happen by and lend poor old Sabjorn a helping hand. He's going to give you the poison to use on the pests, but you're also going to dump it into the brewing vat. Maven and I spent weeks planning this. All we need is someone like you to get in there and get it done. Now get going before Sabjorn grows a brain and hires someone else to do the dirty work." If you ask him why he's bothering with killing the rats he'll explain: "Once Sabjorn is out of the way, Maven has plans for this place. One way or another, we don't want the pests coming back. Consider it just more of the dirty work. I did my part getting them in there, now you need to clear them out." Inquiring about reaching the vats will net you: "Both of the buildings are connected by tunnels made by the pests infesting the meadery. There's an entrance to it in the basement storeroom of the warehouse that used to be boarded over. I've already removed the boards so the meadery would get infested. That's where you should start." If you demand to know why you can't just break in he'll wrongly claim you can: "Sabjorn keeps that locked up tight. If you can get through that way, go right ahead." Finally, if you ask about his motives he'll reveal his plans for the future: "If this plan works, not only is my debt gone, but I'll be set up for life. Maven and I worked out a little deal. If Sabjorn ends up in jail, she's going to take over his meadery. And guess who gets to run the Black-Briar Meadery in Whiterun? You're looking at him." Once Sabjorn has been escorted out, he'll lay out his vision for the future: "Start changing it over to the Black-Briar Meadery West as soon as possible. That was Maven's part of the deal. She's put me in charge of keeping the mead flowing, so that's exactly what I'm going to do. If you're in the area and you ever need anything fenced, you just let me know." If you press him about Hamelyn he'll admit: "I thought it would be better to leave some of the details out of our previous discussion. Didn't want to risk you walking away from the job. Besides, you've done Maven a favor getting rid of him and saved me from wasting coin hiring someone else to do it later." After this you'll find him strutting around the bar area the whole day, basking in his new position. At midnight he'll call it a day and go to sleep for six hours, although he'll now sleep in the comfortable double bed in Sabjorn's old quarters. When talking to Eimar, he'll now point you to Mallus: "If you're looking to purchase any mead, speak to the brewmaster, Mallus." or "Mallus is teaching me everything he knows about brewing. Hopefully, I can take over his position some day." He doesn't seem too pleased of the change in ownership though: "It's a shame the Black-Briar Meadery took this place over. I never liked it as much as our Honningbrew." If you talk to him after the related quest, he will assume you are looking for a fence, greeting you with one of the following: "Been a while since I've seen you at the meadery. Bring me anything interesting? ", "What brings you to Whiterun? Got some juicy goods to sell? ", "What have you got for me today? Nothing illegal I hope! ", or "I've got plenty of good merchandise for you. Take a look." If you have offended the Thieves Guild, he will not do business with you and will only remark: "I heard about what you did at the Guild all the way out here. Sorry, can't buy or sell anything from you." You can ask him how well business is going, which will have him gladly tell you how much he's enjoying his new position: "How could I complain when I went from Sabjorn's lackey to one of the wealthiest merchants in Whiterun in no time at all? Plus, the meadery's doing so well, I'm almost having trouble keeping up with the demand. I'd say things couldn't be any better." Mallus will close dialogue by asking you to do a favor for him: "Do me a favor. If you speak to Maven, tell her everything's well at hand down here, okay?" This is the merchandise found in Mallus's merchant chest. These items are only available if purchased from the merchant; they cannot be pickpocketed or stolen. They are restocked every two days. Mallus Maccius may not have the option to sell merchandise after completing Dampened Spirits, despite offering to provide fence services to you. Instead, at odd hours of the day, he will respond as if the player is disallowed from entering the building. A possible fix for this is entering the Meadery through the basement. This page was last modified on 24 December 2017, at 05:39.